The Dolphin Boathouse is an exceptional New England-style house by the sea on the Isle of Wight with 400m of waterfrontage, and a private pontoon overlooking Wooton Creek. The exterior is extremely attractive, while the interiors are light and modern, and all the principal reception rooms and bedrooms have spectacular views out over the water. In particular, the dining room and conservatory interlink and open out via double doors onto a dining terrace which is an enviable outdoor space. The property comes with eight bedrooms. Outside are an acre of gardens and grounds which have pathways, terraces and seating areas. The sea wall has been recently rebuilt to protect the property. There are around 400 metres of waterfrontage including two private slipways and a 54ft double-sided pontoon available for use at high tide. 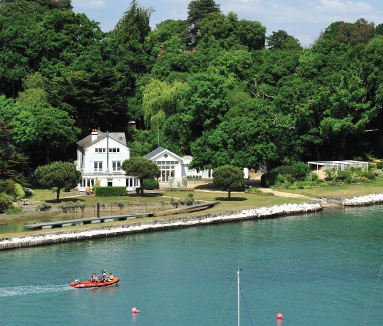 Wooton Creek is one of the Isle Of Wight’s best locations, offering wonderful privacy in a naturally stunning location. Wooton Ryde is moments away with its day-to-day shopping facilities, while Newport is just five miles. Links to the mainland are excellent; Cowes is nine miles. The guide price is £1.7m. For further information please contact Knight Frank on 020 7861 1098 or visit www.knightfrank.co.uk.